CLEVELAND (AP) Derek Lowe never saw the key play that helped him and the Cleveland Indians win the game. 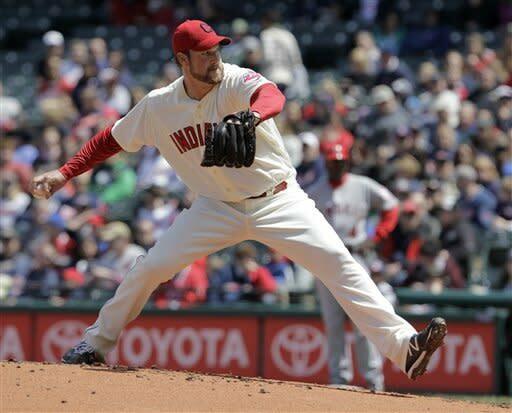 Lowe pitched three-hit ball into the eighth inning and the Indians scored three runs on errors to beat the Los Angeles Angels 4-0 Sunday. Two scored on an error by nine-time Gold Glove outfielder Torii Hunter. ''I've never played the outfield, but I probably would do that myself,'' Lowe said after Hunter lost a routine fly ball in the sun, allowing Cleveland to go ahead 2-0 in the fifth inning. ''The mighty sun was on our side today,'' manager Manny Acta said after Cleveland took two of three from the slumping Angels to claim sole possession of the AL Central lead. Hunter accepted blame for Los Angeles' sixth loss in seven games. ''I lost that game. I feel bad,'' said Hunter who has the fewest errors of any outfielder in history with more than 4,500 chances. The error was only his 36th in 4,525 opportunities. Lowe (4-1) kept his fielders from battling the bright sky by retiring 12 Angels on ground balls, including Albert Pujols three times. 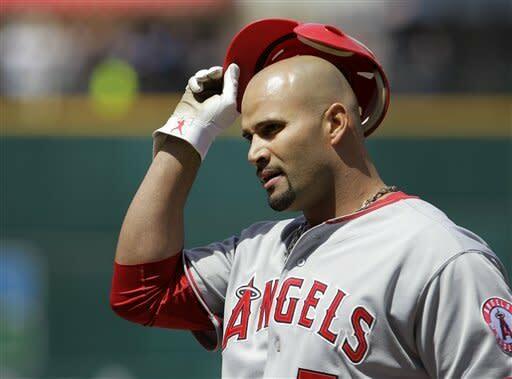 Pujols also struck out against reliever Chris Perez, extending his career-long homerless streak to 117 at-bats. Lowe, 38 and in his 16th season, said his 9-17 record and career-worst 5.05 ERA a year ago with Atlanta is not weighing on his mind. He's more excited to be part of Cleveland's strong staff. Ervin Santana (0-5), in his first start against Cleveland since throwing a no-hitter at Progressive Field last July 27, gave up seven hits and those two unearned runs over seven innings. Pujols is homerless in 22 games since signing his $240 million contract with the Angels. In 2006, he set an April record with 14 homers for St. Louis. The three-time NL MVP hit five homers during the 2011 postseason for the Cardinals, but has not connected in the regular season since Sept. 22. Lowe allowed only a pair of singles by Kendrys Morales over the first 7 2-3 innings before running into trouble. He left after walking Maicer Izturis, who went to third on a long single to right-center by Chris Iannetta. The Indians went ahead in the fifth, putting two runners on in an inning for the third time against Santana. With one out, Aaron Cunningham reached on an infield hit and Michael Brantley walked. Santana struck out Jason Kipnis and appeared about to get out of another jam when Asdrubal Cabrera flied to right. Hunter drifted under the ball, shaded his eyes and ducked as it fell next to him. The Indians quickly ruined whatever no-hit thoughts Santana may have had when Brantley and Kipnis led off the first inning with singles. Santana came right back to get Cabrera to bounce a ball right back to him and the right-hander turned a double play. He then got Travis Hafner to fly out. Santana also escaped a two-on, two-out jam in the fourth when Shelley Duncan popped out. The right-hander is 0-7 since winning at Seattle on Sept. 1. His only win over Cleveland in 12 career starts against the Indians was his no-hitter. He's 1-7 overall against Cleveland. The Indians scored twice in the eighth off Kevin Jepsen, whose throwing error on a sacrifice bunt by Jack Hannahan made it 3-0. Duncan added a sacrifice fly. Cleveland's homerless streak reached 11 games, their longest drought since a 14-game streak, April 10-22, 1983. NOTES: Indians OF Shin-Soo Choo missed his fifth game with a strained left hamstring. He did some running in the outfield during pregame and said he hopes to play Tuesday. ... OF Levon Washington, the Indians' No. 2 draft pick in 2010, will have right hip surgery on Monday. He was hitting .440 in six games at Class A Lake County. Expected recovery is two to four months. ... The Angels are 1-12 when scoring three runs or less. ... Trout, second-youngest player in the majors to Washington OF Bryce Harper, was born in August 1991 - two months after Lowe was drafted by the Seattle Mariners.